2 Corinthians 11:1-6 "I wish that you would bear with me in a little foolishness; but indeed you are bearing with me. 2 For I am jealous for you with a godly jealousy; for I betrothed you to one husband, so that to Christ I might present you as a pure virgin. 3 But I am afraid that, as the serpent deceived Eve by his craftiness, your minds will be led astray from the simplicity and purity of devotionto Christ. 4 For if one comes and preaches another Jesus whom we have not preached, or you receive a different spirit which you have not received, or a different gospel which you have not accepted, you bear this beautifully.5 For I consider myself not in the least inferior to the most eminent apostles. 6 But even if I am unskilled in speech, yet I am not so in knowledge; in fact, in every way we have made this evident to you in all things." When Paul wrote this letter to the Corinthian church, it was already clear that not all was well. A spiritual trainwreck was underway. Corinth was a church so full of potential and was being influenced by teachers who were in opposition to the Gospel of Jesus Christ. In Paul's first letter to this church, issues were addressed that ranged from divisions to rank immorality. By the time Paul had composed this second letter, a year or so had passed. The problems were compounding. Some ground had been won back, however much ground still needed to be gained. Corinth was a church in trouble. There was the threat of the church turning away from what the Apostle and his companions had labored so hard to model and teach. None of the churches that Paul wrote to broke his heart like Corinth. Painful questions haunted his mind as a preacher with a broken heart. Would his efforts end up being in vain? Would the sacrifice, the sleepless nights, the prayers for the church, the pleadings, the faithfulness, would any of things done prior be even remembered? Would the church at Corinth be willing to cast aside their close relationship with Christ and history with Paul for the fleeting fancies of novel approaches to ministry and unbiblical teachers? How can a church avoid this painful scenario we see unfolding in Corinth? Paul pours out his heart to a church that for all intents and purposes is selling out for a "crossless" Gospel and teachers who are flashy and phony. We need to know how we can avoid this painful path as a 21st century church. 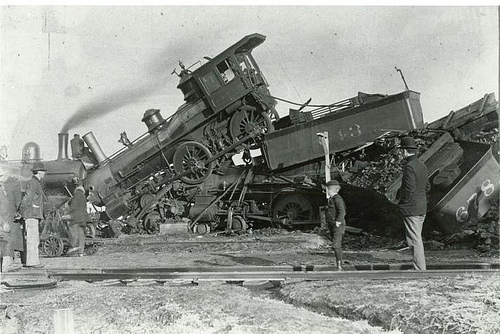 In short order let us consider ways in which Christians and churches can avoid a spiritual trainwreck. Paul writes in 2 Corinthians 11:1 "I wish that you would bear with me in a little foolishness; but indeed you are bearing with me." He writes in his prior Epistle how the preaching of the cross is "foolishness" to those who are perishing. (1 Corinthians 1:18) We as preachers and persons in the pew are guilty of looking to other methods for attracting people to our churches. The issue of course lies in the fact that we have forgotten our calling. We are not called to attract anyone. Rather, we are to point the way to God's glory in the barren cross, which to a mind untouched by grace is anything but attractive. We hold out the light of the Gospel with our lives to others. Certainly our Christian lifestyle ought to standout and demonstrate the reality of Jesus Christ to a watching world. Influencing others for Jesus' sake is our calling. Attraction methods are faulty because they view people as consumers. Do we do such approaches to improve our numbers? This is why we need to stick to what God has called us to do - with preaching of the Word being central to our church-life. We certainly should never purposefully repel anyone. With that said, we offer the world a miracle book - the Bible. We offer the cross and empty tomb. Since when has anything beyond these been any better? Paul freely calls preaching "foolishness" to the human mind. Yet, God has ordained what no one would commend to commend to us His grace - namely preaching. When will we get it? God's primary method and hub of the local church's ministry is the preaching of the Word. Having various ways in ministering to people is certainly commendable. However, Paul's pleading to "bear with his foolishness" is his way of saying "endure the preaching of the Word". All other ways of serving others are spokes, the preaching ministry of the local church is the hub. Preaching is not important because of the preacher. Rather, God Himself has said as much. The Gospel is not only about conversion, but also ongoing change following conversion. It speaks of victory over sin (Romans 8) and how God is desiring to rescue and restore this creation. (Romans 8:21-25). Sadly, not everyone will be reconciled to God due to their persistent rejection of the Incarnate God Who is the center of the Gospel. But for as many as received Him and believed on His name, as many as He calls, they are those who will be reconciled and represent a foretaste of things to come. (John 1:12-13; 2 Corinthians 5:7;17; 1 Peter 3) Unless churches emphasize the Gospel, we will become million dollar houses of worship with dollar menu religion. Many teachers today want to entertain. Some want to embrace success or self-esteem as the definitions of what constitutes fulfillment in life. Is God interested in our happiness? Yes and No. No, if that happiness is in anything else but Him. Yes, if that happiness is in nothing else but Him. When Paul writes in 2 Corinthians 11:6 "But even if I am unskilled in speech, yet I am not so in knowledge; in fact, in every way we have made this evident to you in all things", the knowledge of which He speaks is knowledge of God in Jesus Christ. This is not merely "cranial" head knowledge nor sentimentalism draped in the garments of fell-good religion. This "knowledge" is a relationship with God in His Word that entails the head, the heart and one's entire life. Perhaps the best cross-reference to unpack this particular point is found in Philippians 3:9-11 "and may be found in Him, not having a righteousness of my own derived from the Law, but that which is through faith in Christ, the righteousness which comes from God on the basis of faith, 10 that I may know Him and the power of His resurrection and the fellowship of His sufferings, being conformed to His death; 11 in order that I may attain to the resurrection from the dead."